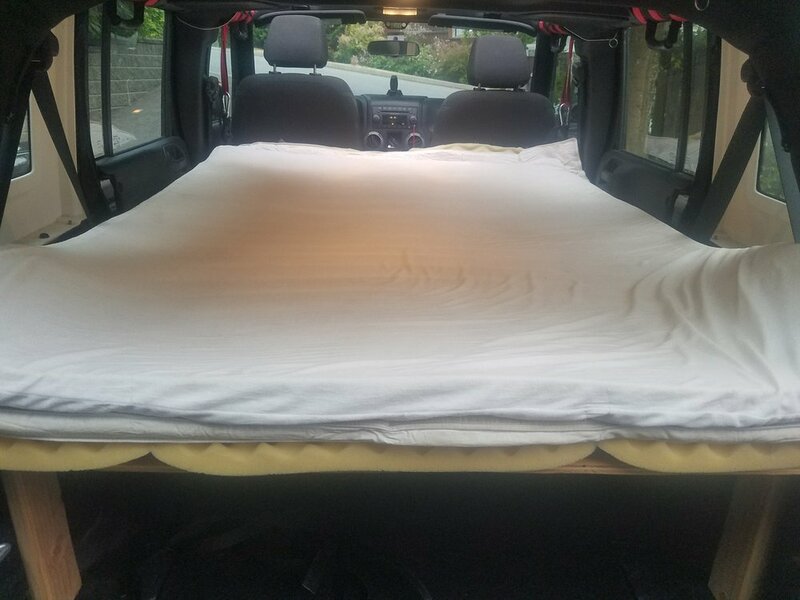 Since starting our road trip around the US and Canada, we’ve received a lot of questions about our sleeping arrangements when we weren't house sitting. While some of our time was spent tenting, the majority was spent in the back of our 4 door Jeep Wrangler. 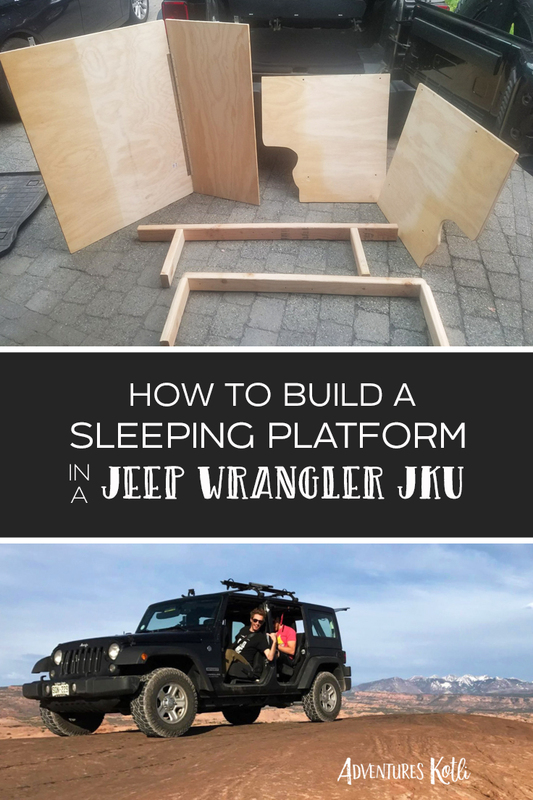 Everyone has at least one friend with the coveted sleeping platform in the bed of a Tacoma, or a sweet VW Westfalia, but I was hard pressed to find someone who had successfully built a sleeping platform in the back of a Jeep. For the support, we cut down the 2X4s and screwed them together. Fairly straight forward. The platform was a little trickier. We ended up cutting the plywood into 4 pieces – the first 2 pieces would become a semi-permanent platform that stays put whether the platform is deployed or not. Some contouring was needed here to get a nice snug fit. We connected the second 2 pieces with the piano hinge. These 2 pieces fold together and lay on top of the 1st platform when not deployed. We rigged up a support system for the front of the platform by screwing the eye hooks into the ends of a 2X4, feeding the long piece of static webbing through the eye hooks, and attaching the ends of the webbing to the quick draws which were suspended from roll bar. To keep everything in place, we drilled 8 holes through the plywood platform and the support 2X4s. Dropping the metal pins into the holes keeps everything aligned and stable. 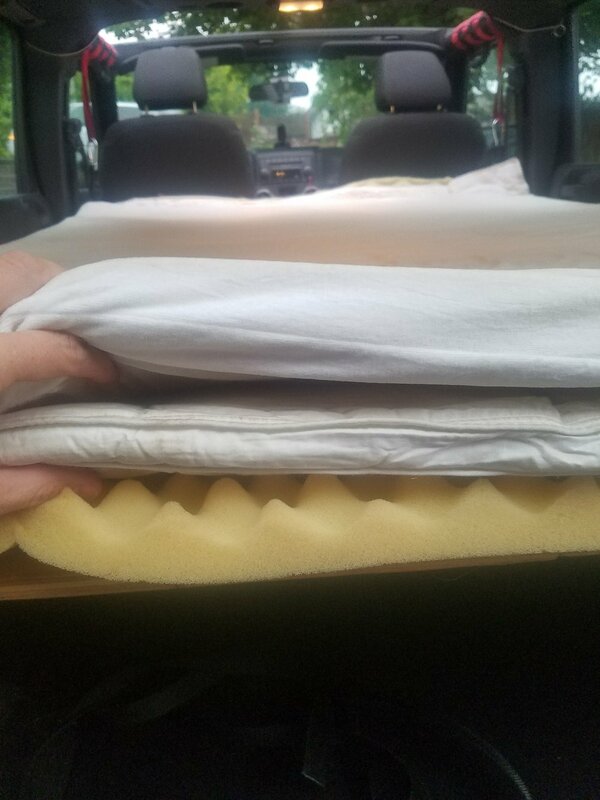 Lastly, I scrounged up an egg crate foam pad, a down mattress pillow topper, and a memory foam mattress pad. 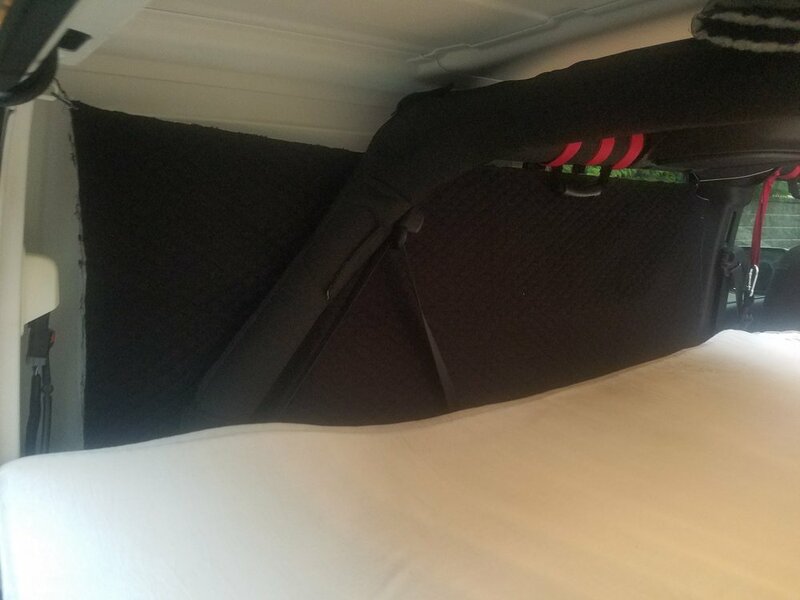 I was able to create a super comfy full-sized mattress by staking these 3 layers on top of each other. I was also able to hang up some curtains using string and command strips. I don’t think Megan would have been OK sleeping in the Jeep without them so it was worth the investment. The beauty of this system is that we can fold up or deploy the entire platform within 10 minutes. We could also store the thing in the trunk without taking up any storage space (it arguably created storage space). All in all, we are super happy that it wasn't too difficult to build such a functional sleeping platform. Thanks for reading and please let me know if you have any questions!